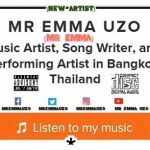 Hi Everyone,I Am Mr Emma Uzo OR You Can Call Me Mr Emma, I’m A Music Artist Based In Bangkok. It’s My First Time Here And I Will Like To Know You All,Feel Free To Ask Me Whatever You Wish And I Will Be Happy To Answer You Accordingly. Follow Me On All Social Media For More Details. Thanks You All For Your Support,Once Again It’s My Pleasure To Be Among You All Today,Remains Bless With One Love. Mr Emma – Ofor Ndu is out,Click to Listen. I’m Open For All Opinions,Feel Free To Drop Your Comments And Tell Me What You Thinks. I'm Open For All Opinions,Feel Free To Drop Your Comments And Tell Me What You Thinks.